Since 2001 Hunter Brothers have been creating incredible corn maze designs that amaze and delight generations of guests. Celebrating the Maple Leafs 100th season in the NHL. Featuring the team's young talent, Mitch Marner and Austin Matthews. Celebrating the 40th season of the Toronto Blue Jays featuring Jose Bautista's infamous "Bat Flip". 2015 marks the 35th anniversary of Terry Fox's Marathon of Hope. The maze features a larger than life image of Terry just steps from the road he ran along 35 years ago. We were honoured to have Darrel Fox, Terry's brother, come to officially open the maze. Hunter Brothers celebrated 175 years of John Deere with a maze featuring a John Deere 4020 row crop tractor. Hunter Brothers have run a variety of John Deere equipment on their farm including a 1972 JD 4020 and 2003 JD 6420. As lifelong Canadiens fans, Chip and Tom could think of no more fitting tribute than a maze celebrating the team's 100th season. The maze features Chip's hockey hero Jean Beliveau, who actually called Chip to thank him for the incredible tribute. 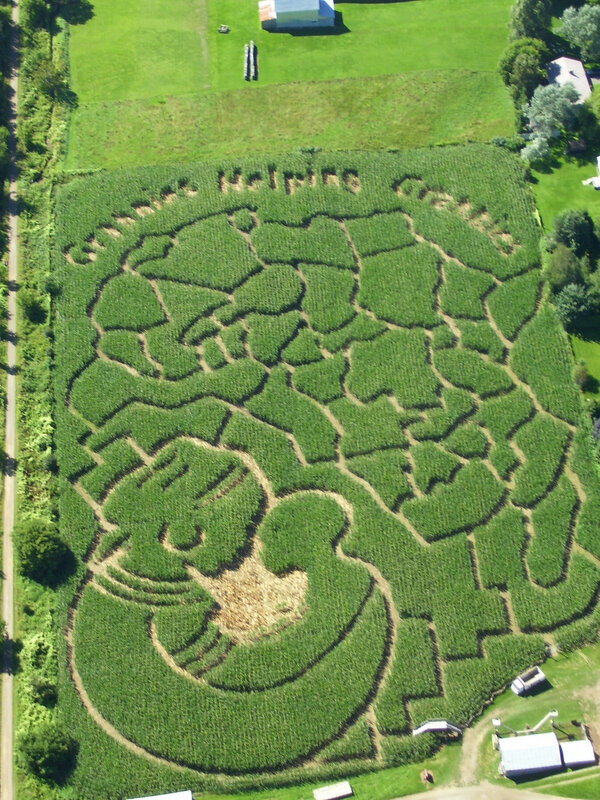 Our 2006 maze featured the African continent with the logo created by the Go Go Grannies in Creston, B.C. to support the Grandmothers to Grandmothers campaign. This Stephen Lewis Foundation initiative encourages Canadian grandmothers to unite and support their African peers who are now left with the responsibility of raising their grandchildren as a result of the AIDS pandemic in Africa. Hunter Brothers Farm donated a portion of their maze proceeds to this cause and encouraged maze adventurers to do the same. A tribute to Patrick Roy as he retired from playing hockey. Our 2014 maze celebrated 50 years since the Beatles first arrived in Canada. Ten years of corn mazes and Hunter Brothers celebrate their tenth maze with Thomas the Tank Engine. It's been 65 years since the first book in The Railway Series was published and 2011 is the 100th anniversary of the author's Rev. Wilbert Awdry's birth. Leigh Hunter built a scale model of Thomas which was featured in Florenceville-Bristol's Canada Day parade. It won first place! What better way to celebrate one of New Brunswick's resources than with another. 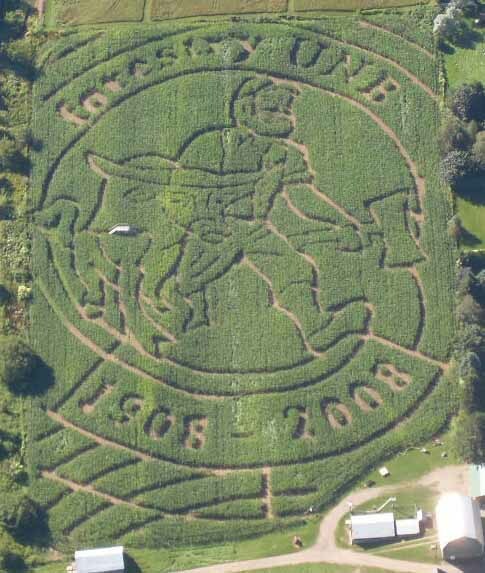 2008 was the University of New Brunswick's Faculty of Forestry's Centennial year, so Hunter Brothers' corn maze featured a lumberjack, axe in hand, walking along side his ox. Chip and Tom's father, Borden Hunter, and their beloved Uncle Art were both proud alumni. Our 2005 maze was a tribute to the Alberta and Saskatchewan's Centennial Year featuring the outline of both provinces and their Centennial logo in the middle of each province. It was our most elaborate undertaking yet requiring over 2200 connect-the-dot coordinates. Sunny Day, Sweepin' the clouds away. On my way to where the air is sweet ... (and corn too!) What better way to celebrate Sesame Street's 40th anniversary than in a field of fun. In 2010, Hunter Brothers sculpted the likeness of Ernie and Bert, Big Bird, Elmo and the Cookie Monster in their six acre corn field. The Carleton North High School Jazz Band played the Sesame Street theme song as part of the Grand Opening festivities. A delicious cake with Sesame Street friends was enjoyed by all. In 2007, to pay homage to the 50th anniversary of The Cat in the Hat, Hunter Brothers carved out Dr. Seuss’ loveable Cat in the act of balancing on a ball with his rambunctious friends Thing 1 and Thing 2 underfoot while the Fish in a Pot is precariously perched on the handle of an umbrella. We celebrated the 400th anniversary of Acadie in 2004. Our first corn maze design celebrated New Brunswick Day.